Disclosure- I received the mentioned product courtesy of the sponsor for the purpose of this review. All opinions are genuine, based on my experience with the product, and have not been influenced by promotional items. Dinner has been a little odd around here for the past several months. Ever since Jason started the Keto diet, we've had a mutual agreement that we'd all just fend for ourselves for the time being. I eat completely opposite of him now, so I've been trying to find vegetarian recipes that make enough and are tasty enough to eat for two nights in a row. 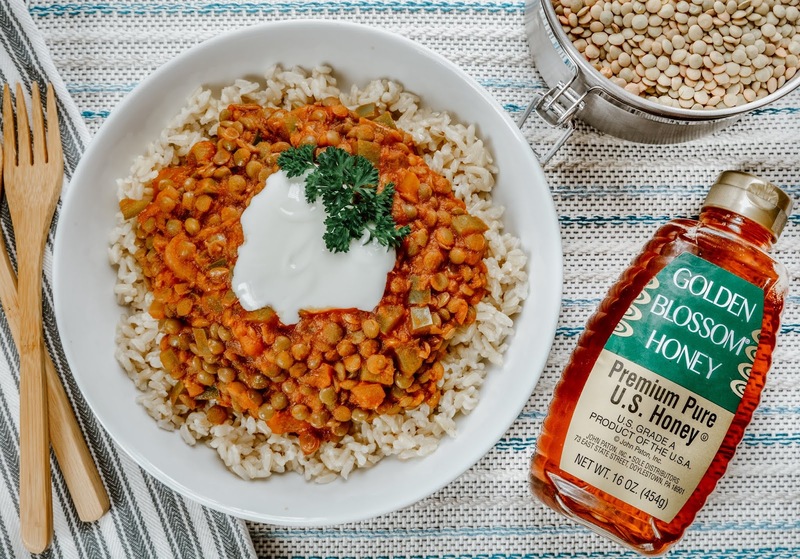 I am a big beans and rice kind of girl, so it was a no-brainer for me to try this Vegetarian Sweet & Sour Lentils recipe from Golden Blossom Honey this week. I love using lentils whenever possible because they are low in fat, but high in protein and fiber, which helps keep me feeling fuller longer. This recipe feels Asian inspired, but without the chicken or beef that you'd normally find in Asian dishes. You can use white or brown rice to serve with these lentils, but I always go for brown since it has more nutrients and fiber over white. When I store the leftovers for the next day, I mix the lentils into the rice instead of piling them on top to keep the rice from drying out or sticking together. This is a great make once, eat twice meal. Just zap it in the microwave for a minute or two or reheat on the stove and you're all set for dinner on day 2 without any extra work on your part. What's your favorite food to have as a leftover dinner option? Amazing how you manage to keep everyone full and happy with all the different diets and food plans! Luckily for me all of us eat high-protein, although Lil Pumpkin and the boy eat more carbs and fat. Ooooh, if Jason is doing Keto and also going to the gym he'll be all deliciously muscly soon, dahlink :))) How is Keto influencing his blood? You now I love me lentils, but I do much prefer the red ones. I wanna try red quinoa too, but it is extremely expensive for some reason. I think he's lost about 10 pounds so far on the diet, but he's also building muscle, so the numbers aren't dropping as fast as he'd like to on the scale. I can definitely see a difference though. He used to have ungodly high blood pressure, but it has returned to normal levels. That's weird your red quinoa is more expensive there. It all costs the same here. I usually buy the multicolored bag and use that for my veggie burgers. I have started using red lentils too, though for this post I was trying to use up some of the green variety that I've had tucked into my cabinet for quite some time. It's because quinoa is still relatively new here. The same goes for red chia, white chia, black sesame, psyllium, and such more exotic varieties, sadly. But he doesn't get higher cholesterol from Keto? Nope, before he started his body was all out of whack. It seems like the diet is helping to turn things around for him. He does plan on stopping it, or reintroducing carbs in small amounts though once he reaches his target weight, so we'll see if his levels rise again then. I bet the raspberry chia spread will look thrilling! And how is lil' lady L reacting to your food? Hope she ain't picky at your castle! I've never made lentils, I'll have to give them a try. I never tried them until I went vegetarian, but my husband (who is not veg) loves them too. I hope you try them, but be sure to add a pinch of baking soda in with your recipe to combat the gas and bloating that tends to come with consuming them. We have lentils often. I like the orange kind the best. I've been in a soup mood, so some kind of soup is always good for leftovers! I always double up on soup because I love it for leftovers too. Especially something like chili where it's much better the next day. I make all sorts of lentils everyday as I'm a vegetarian. 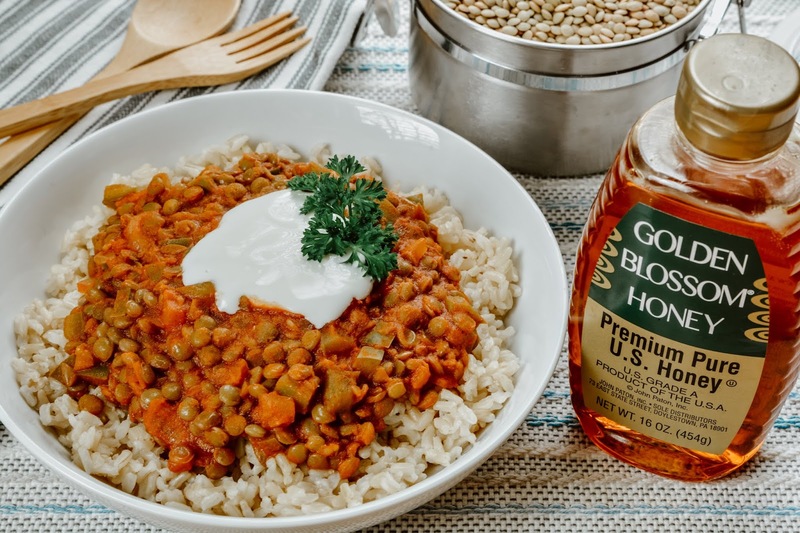 Adding honey to a lentil dish is so new to me. Would like to try it as am sure its a good balance of both sweetness and sourness. Lentils and rice is definitely a healthy tummy filler. This is a great recipe! The combination of sweet and sour is very appealing. I might have to make this for something different! Just delicious Theresa, we love lentils here!! Hugs! This sounds good to me. I'm always happy to come across vegetarian recipes, especially if they taste just as good or better on Day #2. A win when you only have to cook one day and get two days indeed. Looks good, Theresa! I enjoy lentils, and I can taste this recipe as I read it. Fortunately Terry eats anything I put in front of him.